Sea Island waterfront real estate often includes marsh front homes with docks. Some people may not see the docks as the propertiesâ€™ most important features but there are those who do. Examples include buyers who hope to bring their existing boats along or invest in deep water yachts. That said, we wanted to point out this Forty Seventh Street Sea Island property. Unlike others, it features a decked out dock. Whatâ€™s so decked out about this dock in particular? For one, itâ€™s covered and boasts a private balcony. The private balcony is perfect for enjoying sunset dinners and mint juleps by the water. But we know some of you will love the floatable dock and boat lift more. Boaters already know that docks and lift kits come in different varieties. This one is solar-powered, which gives it a number of advantages over their electric-powered counterparts. For one, the sunshine known to kiss Sea Island Georgia most days of the year will ensure three things. Those three things are that the lift is energy-efficient, cost-effective and reliable. And because it has no motor to speak of, chances are the liftâ€™s maintenance needs will be small. This may be important to boaters whoâ€™ve seen what salt water can do to electric winches and metal cable gears over time. Speaking of maintenance, this Sea Island Georgia real estateâ€™s floating dock is in excellent shape. Floating docks, in general, tend to be because they are relatively easy to care for and replace. While we are on the subject of replacement, prospective buyers should note that the propertyâ€™s large enough to accommodate other dock configurations. So those with their hearts set on upgrading to a new cantilever, vertical or freestanding lift should be able to do so without trouble. 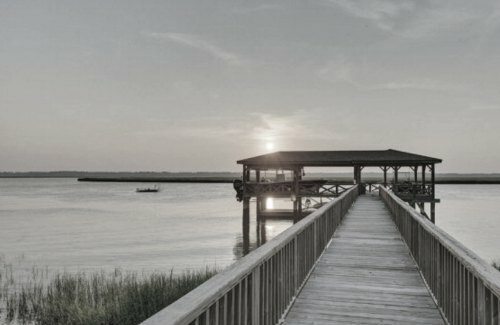 To learn more about this propertyâ€™s dock setup and other Sea Island homes with boating access, please contact us today. Looking to Plant More Than Just Your Feet on Sea Island, GA Real Estate?